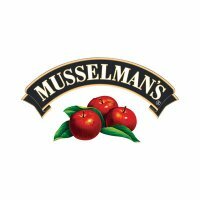 Awhile back, I worked with Musselman's to review and host a giveaway of their apple sauce. My daughter loves their apple sauce. She is very picky when it comes to apple sauce. Frankly, she had refused to eat any sort of apple sauce until she tried Musselman's apple sauce. So, when the company emailed me and told me that they just released 2 new favors and we were offered the chance to review them, there was no way I was going to turn it down. The two new favors are Healthy Picks Granny Smith and Totally Fruit Mixed Berry. Just like the last time we reviewed Musselman's Apple Sauce, DD was in love with the new favors as well. She likes to eat them as dessert after dinner and sometimes I would give her one when she gets home from school in the afternoon. 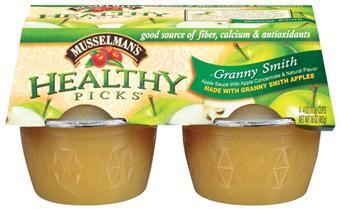 I love that Musselman's Apple Sauce is naturally sweeten with fruit juice and tastes great! It is truly a snack that the whole family enjoys. To buy your own Musselman's Apple Sauce, please visit its website for retail stores near you. Many thanks to Musselman's. The company has generously offered the same products we received to review as giveaway prizes to one of my lucky readers (US residents only please). 1). Please go to Musselman's and then come back to tell me about another product you would like to try (you MUST be a public follower of my blog to enter this giveaway, and your profile can not be set at private). 2.) Blog about my giveaway- with a link back to here, when you leave the comment make sure you include the URL of where your post of my giveaway is. Please do not copy and paste my review over to your blog, please write about why you would like to win this giveaway and provide a link back to this post. The Contest ends Nov 6th, 2010 at 11:59pm PST. Blogging about my giveaway earns 2 additional entries. 7.) Tweet about this review and giveaway. Please tweet the following: " I want to win Musselman's Apple Sauce @ http://www.sugarpopribbons.blogspot.com/ ". After your tweet, please leave me the url of your tweet so I can check. If you do not know how to check your tweet url, please read this post for step by step instructions. You can retweet once a day for 1 entry each time. I would like to try their apple butter. I am a gfc follower. I'd like to try the unsweetened organic apple sauce. I commented on the DISNEYNATURE: OCEANS on Blu-ray & DVD Review. I entered your Tatutina Step Stool Giveaway. I entered your PriaVanda Giveaway. I entered your Sassy Glass Giveaway. I entered your amykathryn Handbag Giveaway. I entered your Little Pea $20 GC Giveaway. I entered your Combi Tatami Play Yard Giveaway. I entered your Theraline Maternity and Nursing Pillow Giveaway. I entered your Apple Cheeks Giveaway. I entered your Tulle trench coat Giveaway. I entered your Real Nappies Cloth Diaper Intro Pack Giveaway. I entered your Happy Heinys Cloth Diaper Giveaway. I would love to try their apple butter! I'd like to try the Musselman's Apple Butter! I am a follower and would love to try the apple butter! the apple butter sounds good. I entered your Liliputians Birthday Shirt Giveaway. I follow on gfc and would love to try the Musselman's Apple Butter. The Apple butter sounds great.Thanks for the chance. I just entered your Musselman's apple sauce contest. I entered your Green World Bags Giveaway. I entered your BobbleRoos Toddler Pillow With Blanket Giveaway. I entered your NotyBaby Giveaway. I entered your rethinkcrafts Cloth Diaper Cover Giveaway. I would like to try the Key Lime Creme Pie Filling. I entered your Fairytale Tutu's Personalized Bag Giveaway. I entered your Twinn Doll Giveaway. I entered your Beco Baby Carrier Beco Mini Giveaway. I'm entered in the Green Mountain Coffee giveaway. I'm entered in the Happy Heinys giveaway. Follower via GFC, and I also like their Apple Butter. I entered your Disney Tangled Prize Pack Giveaway. I entered your Guidecraft Midular Science Center Giveaway. I follow you on GFC (Sarah Matos). I would like to try Musselmans Pie Filling. I'd like to try the HH Starter Kit. I'd like to try the Sliced Apples for some of my recipes. I entered the My Twinn giveaway. I entered the Tulle giveaway. I would like to try Musselman's Apple Cider! I've never had apple butter so I'd be interesting in trying that too. Apple Butter since my husband hasn't had any in a long time. I would love to try the apple cider. I follow you via GFC as dwellenstein. I like their apple butter. 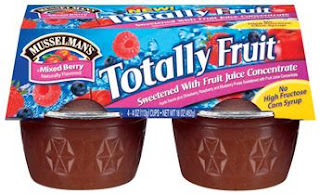 I'd like to try the Totally Fruit Peach Apple Sauce. Thanks for the giveaway! I entered the Patch Bedbugs giveaway. I would love to try the cherry applesauce. I think the premium apple juice would be great. I would like to try the Key Lime Pie Filling. I would also like to try the Musselman's Sliced Apples. Entered the Liliputians Birthday Shirt Giveaway. Entered the Green World Bags Giveaway. Entered the Bobbleroos Toddler Pillow with Blanket Giveaway. Entered the Rethink Crafts Cloth Diaper Cover Giveaway. I would also like to try Musselman's organic unsweetened applesauce. I'd also like to try their apple butter! I entered your Laffy Daffy Giveaway. I entered your KinderGlo Night Light Giveaway.